For the past three months Chef Rick Jakobson, learned from Daniel Boulud and David Bouley, has been feeding me delectable insights of the next great places to eat. 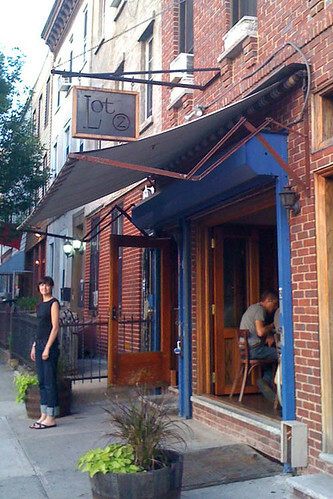 Crossed off the list so far have been Vinegar Hill House, Roberta's, and now Lot2. All friendly bar eating spots too. Just a leisurely stroll from the F train 2 Sundays ago, led us to Chef Scott Bridi's well focused menu on seasonal, market produce and sustainable meats. Chef Scott covers every best option for vegetarians, carnivores and pescaterians. The bartender Ben also pours wine generously. 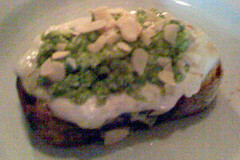 (Left) Sweet Peas, Almonds and Lardo Butter on Toast: I had two reactions. 1. Wow, fresh peas taste nothing like frozen peas, huh? 2. Where can I get some lardo butter of my own? Definitely came from a good pig, because those flavors were deep and rich. 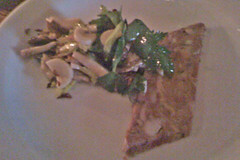 (Right) Lipstick on a Pig with Pickled Mushrooms: One of the best pork pate I have ever had. It's a nice change from liver pates. You could taste all the flavors of the tenderized slow cooked, congealed meat. I enjoyed that the texture was not creamy smooth. The side pickled mushrooms added a nice contrast of textures and acidity. (Left) Olive Oil Poached Cod, Melted Leeks & White Beans: Thankfully, I no longer follow the rule of not ordering fish on Sundays. I was so impressed by the freshness of the fish and its dense flesh quality. 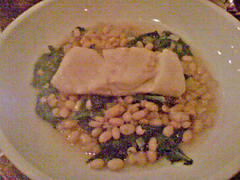 The leeks and white beans (first time with this creative combo to fish) enhanced the mild delicate flavor of the cod. 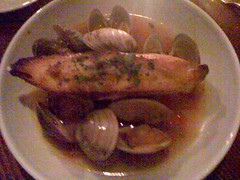 (Right) Steamed Clams, Roasted Tomato, Fresh Chilies & Garlic Bread: Yes clams were good. But the best part should always be the broth and garlic bread, which indeed it was! 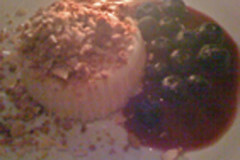 (Center) Vanilla Cheesecake, Almonds, Blueberries: Could have honestly eaten the whole menu since it was so good-- but alas we decided to save room for dessert. Highlight was definitely the toasted almonds topped over the creamy cheesecake. So delish! If you end up liking Lot2, I think you'll enjoy One Big Table's supper club.